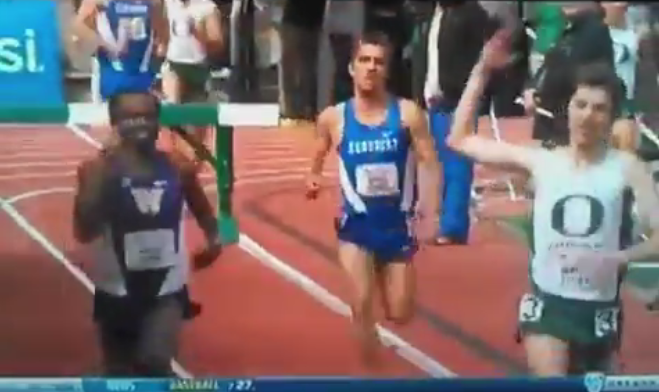 Steeplechase fail: Oregon runner celebrates prematurely, loses. Meron Simon and Tanguy Pepiot, via Twitter user @tkingsta. Noooooo watch out, he’s right behind you! That’s Oregon’s Tanguy Pepiot losing a lead in the 3,000-meter steeplechase to Washington’s Meron Simon at a meet Saturday, proving once again that the wealth and fame available to top steeplechasers have turned the formerly great sport into the province of showoffs and divas. It used to just be about steeples and chasing, you know? But these days all you see is the hotdogging and the bling bling. Just joking. Pepiot looked like he felt pretty bad about what happened; he also said afterward that after his initial gesture he’d mistaken the home crowd’s shouts of warning for cheers. Congratulations to Meron Simon, though.